I've been trusted the care of an angel, and I couldn't save its wings. The priest was smiling to her. She was confused and a little scared. A strange thought was wandering in her mind, an incomplete phrase. It was the voice of the priest, saying to another man "do not worry... she will like it, and will come back for more, and again... and when she resists, we will..." When the priest approached, she didn't like how familiar it felt. He told her that she would find her room outside, in the little build next to the church, and what her job was. His finger felt like concrete, scratching, when he brushed her cheek. A flash came to her memories. She had accepted a gift from the priest, some time in the past. So they met at some point, despite she had no recollection of this. Trying to remember what was that gift, all she would get was a headache, as if somebody were screaming inside her mind. The days went by. Nobody ever stopped by, not even by the graveyard, which she visited daily. The candles in the darkness of the church always brought flashes of lost memories to her mind, but she didn't know what to do with them. The images made no sense. A box with a snake? Another man, examining her from the distance? The priest would always smile at her in a way that made her tremble, freeze. Something in his expression told her that he was waiting... for the right time. She decided she had to run away from that eerie place. She would do the next day. That night, she had a strange dream. In her dream, she was in bed. She could hear the priest and another man talking about her past, the sin, the shame she had brought. Then she saw what was the gift. She wanted to take it but remembered, this was not the first time. Something happened next, all the other times. A hooded otherworldly creature showed up in her room, the bed cover was suddenly a mess and she could feel the creature was coming for her. 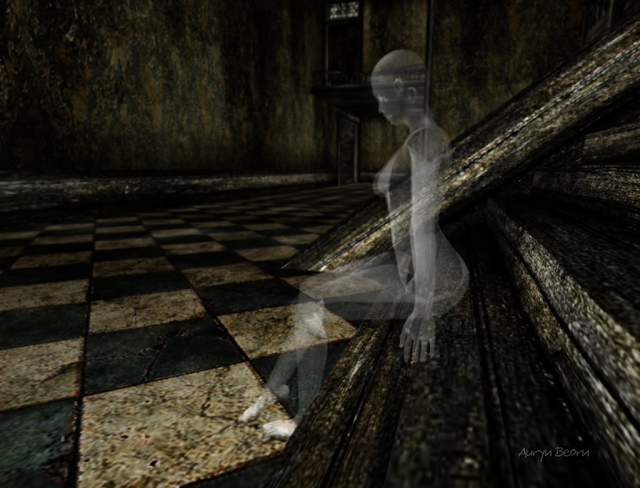 She screamed, screamed while trying to stand up and avoid that ghostly touch... and woke up. Her heart was still racing when she looked to the left. The moon light coming by the window allowed her to see that the creature was still there. Her voice failed and she tried to turn the light on. The light switch wasn't working. Rigid, scared, she then looked to the right. Lying next to her, on the bed, there was another of those hooded creatures. She screamed loud but her voice wouldn't come out. The creatures showed their faces. One of them was the priest. And the other one... Could it be? Could it really be? Sarah wanted to learn the secrets of the afterlife and spells to bring spirits back to Earth. She knew of a magician that took her under his tutelage. She learned the basics, but her eagerness about darkness soon gave her away, and the magician became cautious. Expecting that Sarah would steal a small book with the most powerful recipes (for apprentices always wanted to run before they knew how to walk), he cast a spell upon it. The book was sealed. Five days later, the Full Moon was up in the sky, and Sarah took what she thought her best chance. As the magician predicted, she stole the book and fled, hiding in the cemetery. She sat on a stub next to the mausoleums, ready to open the book. The book wouldn't open, though. She mumbled, cursing the magician and the book at the same time, and spent a while thinking. She remembered a spell to open sealed boxes, and decided to try. "A closed box and a closed book are the same things. Closed things," were her thoughts. She put the book on the ground and her hands were over the cover. She said the words, feeling her fingers tingling. Smiling, she looked down, finding that the book had opened. Her eyes danced over the pages and found what she had been searching for. The spell was difficult, but if successful, she could invoke a shadow from the death, a stealthy creature that would follow the people she wanted, making for her to see inside their minds and learn their best kept secrets. A blurry shape started to show on the mirror. It was a woman. Bald, white, Sarah could see through her. The woman seemed to be sleeping, then she raised her head and started to look around. Sarah was excited and, at the same time, a little scared. She had the creature right in front of her. Now what? The woman smiled, showing her palms, reaching to the mirror's surface. "Touch my hands, Sarah," she said. Sarah walked closer. Her hands doubted. "I know why you summoned me. I will first visit the magician, and tell you all that he hides in his mind. Touch my hands, Sarah, and it will be done," the woman on the mirror insisted, in soothing tone. The mirror's surface felt warm in Sarah's hands. The sensations were puzzling. The mirror seemed to melt in her hands while the woman inside started reaching outside, walking through Sarah. Before she realized, Sarah was inside the mirror, confused. Outside, the ghostly woman was nowhere to be seen. The magician was there, instead. His expression, stern, revealed that the deceiving woman inside the mirror was the actual spell sealing the book. She started to cry, begged him to release her. He only said, "Think about what you did, Sarah. Think. You will be staying here for a long time." He then turned around, and walked away. I can't remember when I sat on these steps to wait for you. All I know is that it feels like a long time. You asked me to wait here, no matter what. You said you'd be back in an hour, but the truth is that I have no recollection of what happened. Did I really see you show up? Were you the one carrying that needle in your hand? I don't know. Those images are blurred in my memories, then they fade to black. I can just say that I'm here, waiting for you, as you asked me to do. But there's so much I don't understand. I feel empty, and... is this cold? Why does it feel so dark? Why I cannot feel my body anymore? I'm scared... Where are you? Will this wait take any longer? The story of my life isn't but the story of the stories I choose to remember, imagine, reinvent, and tell. Some of them get better and more detailed as time goes by. Others, richer in pain, gloomier and darker. Others cease to exist as I no longer feel interest for them. And others have a special place in my heart, because I was never able to remove the knife. "I mourn my mother. I mourn my other mother. I mourn so many people that are still alive. When did my life turn into a cemetery of living dead?"